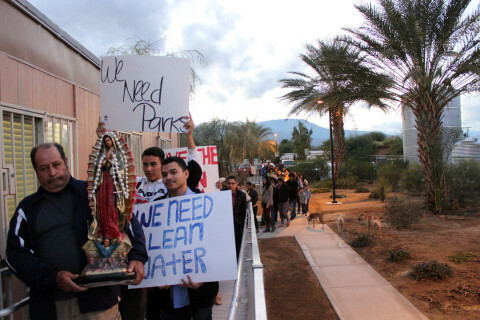 Residents from the Eastern Coachella Valley gathered for the Virgen de Guadalupe processional, this time to bring awareness to the environmental issues facing their communities. High School students carried signs reading, “Save the Salton Sea,” “We Need More Parks,” and “We Need Clean Water” – just a few priorities declared by the group. “We are supposed to be ‘criadores de creacion,’ (people who care for creation) and so creation is a very important aspect of our lives. We need to care for one another, and we need to care for the environment.” See more on Coachella Unincorporated. This entry was posted on December 18, 2014 by Editor in Coachella Unincorporated, Print and tagged Advocate!, Eco/Environment, Protest!.